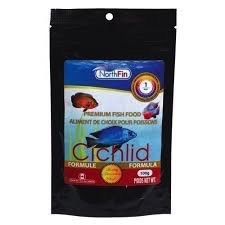 Aquaria Cichlid Formula - 1 mm Sinking Pellets - 100 g - Rick's Pet Stores Inc.
Cichlid Formula - 1 mm Sinking Pellets - 100 g NorthFin Cichlid Formula is professionally developed to improve the health and well-being of your Cichlids and other freshwater fish, while naturally enhancing their brilliant colors. Made exclusively with premium quality ingredients, this balanced and nutritious daily diet is completely free of fillers, hormones, and artificial pigments. Easily digestible, slow-sinking 1 mm pellets promote optimal nutrient absorption and help reduce the amount of waste in your aquarium. Proudly made in Canada. All NorthFin premium fish foods are made with the following key ingredients: Antarctic Krill - Krill contains high quality protein, amino acids, vitamins, and minerals. It is also a natural source of carotenoids, which bring out the rich and vibrant colors of your fish. Contains a high concentration of Astaxanthin which is a powerful natural pigment and antioxidant. High Omega-3 Herring Meal - The highest grade fish meal, Herring Meal contains a higher concentration of DHA which promotes healthy development, growth, and coloration in fish. Freshly caught and frozen. Certified Organic Kelp - A type of marine seaweed, Kelp supplies approximately 60 minerals, 21 amino acids, and 12 vitamins. It also provides nitrogen, potassium, and micro-nutrients. 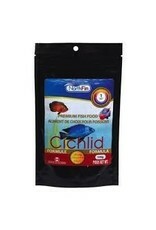 Improves the overall health and activity of your fish. Spirulina - This 100% natural blue-green algae is packed with raw proteins and a wide range of vitamins and minerals to promote optimal health and improve immune function. It also contains beta-carotene and other natural pigments for color enhancement. Calcium Montmorillonite Clay - Contains 67 minerals including calcium, iron, magnesium, manganese, potassium, silica, and more. Also provides essential trace elements. Helps compensate for previous dietary deficiencies.